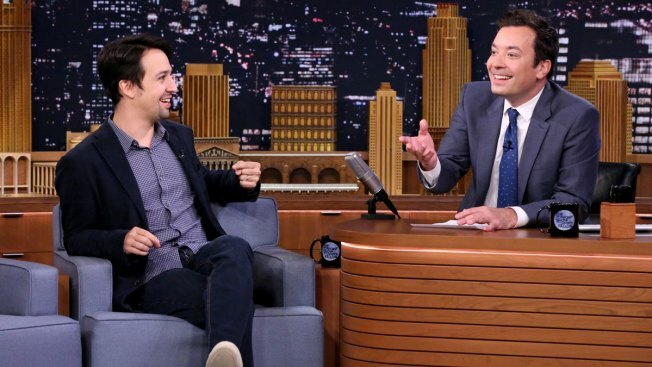 This Oct. 4, 2016 image released by NBC shows Lin-Manuel Miranda during an interview with host Jimmy Fallon on "The Tonight Show Starring Jimmy Fallon," in New York. Fallon’s “Tonight Show” broadcast from Puerto Rico on Jan. 15, will showcase artists with ties to the U.S. territory. Besides previously announced Miranda, Fallon will be joined on the show by Jose Feliciano, Bad Bunny and Ozuna. Jimmy Fallon's "Tonight Show" broadcast from Puerto Rico will showcase artists with ties to the U.S. territory. Besides previously announced guest Lin-Manuel Miranda, Fallon said Thursday he will be joined on the Tuesday, Jan. 15, show by Jose Feliciano, Bad Bunny and Ozuna. The three musicians are natives of Puerto Rico. Chef and activist Jose Andres also will be part of the NBC show. Andres led a grass-roots effort to feed island residents after 2017's devastating Hurricane Maria hit Puerto Rico and Dominica. The show aims to highlight Puerto Rico's culture as well as what it still faces after the disaster, including restoration estimated by the government at more than $130 billion. "A tremendous amount of work has gone into rebuilding these vibrant, beautiful communities, and there is still so much more that needs to be done — and we want to continue to help," Fallon said. The New York-born Miranda, who's performing in his award-winning Broadway musical "Hamilton" starting Friday in San Juan, is of Puerto Rican heritage and regularly visited the territory as a youngster. In a statement, Miranda said he appreciated that Fallon was "breaking with the traditional late-night mold to celebrate the beauty and culture of Puerto Rico" and help promote tourism. "My family, along with 'Hamilton,' are dedicated to continuing to aid in Puerto Rico's strive for prosperity and we are thankful to be able to call Jimmy and the 'Tonight Show' team friends and partners in this mission," Miranda said. He and the new "Hamilton" touring cast will perform the musical's "The Story of Tonight." Bad Bunny said viewers will see the island is still recovering but has retained its spirit, adding, "we are happy, we are dancing, playing music, enjoying our amazing food because 'Estamos Bien'" — or "We're Fine," the title of his hit single. He is set to perform his song "MIA," while Feliciano and Ozuna will join on the popular tune "En Mi Viejo San Juan" ("In My Old San Juan"). Andres will discuss the continuing Puerto Rico efforts of World Central Kitchen, the nonprofit he founded that's working to revive the island's food economy with grants and training for small farms. The episode also will include Fallon's tour of Puerto Rico to highlight what it has to offer, including its "breathtaking beauty" and exciting activities, NBC said.